Hello folks! Everything around me looks so festive and merry. The beautifully adorned Christmas tree in every nook and corner of the street, the colorful lights hanging everywhere, the cafes beaming with lots of freshly baked goodies and not to forget the conversations going on everywhere as to how one is celebrating Christmas. Amidst the endless baking going on in my kitchen, I feel I need a small break to make something comforting and simple. Hence we have a Quick Homestyle Sandwich Alert! Sometimes all I need is a simple sandwich to feel good. 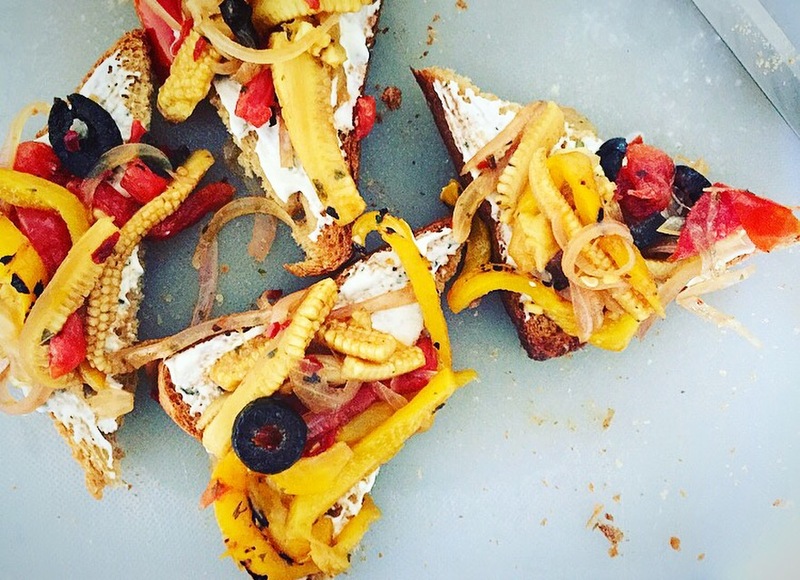 Chop some basic ingredients, slather it on yoru favourite bread, toast it and you’re done. 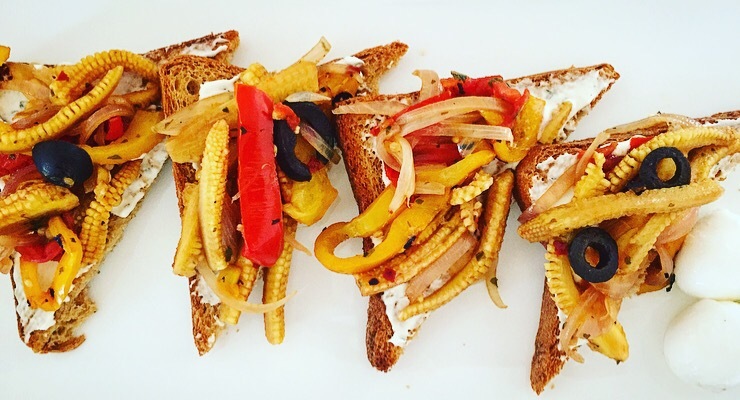 I made these Mayo and Hung Curd Veggie Sandwich for breakfast a few days back and it was yummy! Chopped few veggies, mixed it with hung curd and mayo, seasoned it, toasted my bread and my breakfast was done. I felt like a superstar. Save this recipe now because you can use all your teeny weeny leftovers to get this delish homestyle sandwich. No frills, no fancies – only goodness! Take mayo and hung curd in a bowl and whisk it until combined. Now add onion, bell peppers, grated carrot, corn kernels, chili flakes, parsley, coriander leaves, salt and black pepper and mix it well. Put a gridle pan on medium flame. Meanwhile take one slice of bread and generously fill it with the mixture you have made in the first step. Make sure to leave some space towards to the edges will putting the mixture. Take another slice of bread and place it on top of it. Take a little butter and put it on the pan. Place the sandwich on the griddle pan and let it cook for 1 minute – 90 seconds. Meanwhile lightly butter the bread on the top. Carefully turn the bread over and let the sandwich cook on the other side for 60 – 90 seconds. Once cooked and golden brown on both sides, take it off from the griddle pan and place it on the kitchen top. Diagonally cut it making sure the mixture doesnt ooze out of the slices of bread. Serve immediately with ketchup or as is. It’s #foodcoma time! These powerhouse patties are an explosion bomb, packed with fresh flavor and great nutrients. I always loved patties since childhood. My mum used to revamp it every single time with different veggies and different herbs to make our meals more exciting! Yes, I get these genes from her. A lot has changed in my life since I have attained motherhood. When it comes to food, I try to eat healthier stuff, more superfood and introduce the same to my child by alternating the favors. To my surprise my 2 year old mini bomb loves it too! These patty is quite literally everything. The delicious concoction of nutritious veggies, the lushness from the fresh herbs and the abundance of super-food all comes together to create a firework of amazing flavors. All this complemented with a zippy yogurt sauce, it is phenomenal. So just when you were pondering what to eat with your cup of tea during monsoons, we’ve got a quick and easy solution for you! Cook the quinoa as instructed in the package. Once cooked, fluff it with a fork and keep it aside. Meanwhile, blanch the spinach leaves and once blanched, run it under cold water. Roughly chop it and keep it aside. In a bowl, mix chopped onion, grated carrot, chopped spinach leaves, chopped basil leaves, parsley, chili flakes, garlic and lemon zest and mix it with a spoon. Add cooked quinoa, lightly beaten egg, salt and pepper and mix the mixture using your hand. Lastly add the Panko bread crumbs and completely mix the patty mixture. Keep it in the fridge for 20 – 30 minutes. Take out the patty mixture from the fridge and using an ice-cream scoop, take a scoop of the mixture, roll it and slightly flatten it. Repeat the process for the remaining mixture. Keep the balls in the fridge for another 10 minutes. Meanwhile take a flat pan and put it on medium heat. Spray 1/2 tbsp of oil. Now put the patty on the pan, drizzle some oil on the patty and allow it to cook until its crisp and golden brown on each side. Repeat the process for all the patty and keep it aside. Take Greek yogurt in a bowl. Whisk it slightly using a wire whisk. Add lemon and salt and mix it with a spoon. Now place the patty in a platter along with the dip and serve immediately!